A new and very unique, innovative mouse has been launched over on the Kickstarter crowdfunding website this week called the ODiN, which claims to be the world’s very first projection mouse. 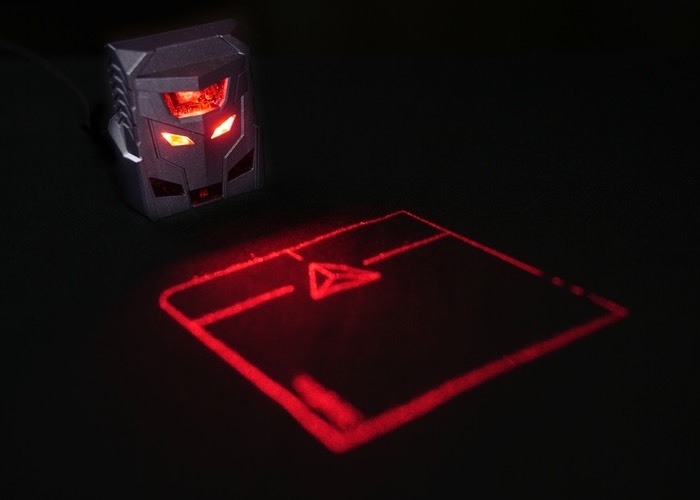 Designed by Serafim the new mouse uses a laser projection to create an area on the desktop or flat surface, that can then be touched in the same way a mouse or tracker pad is used to control a computer cursor on your screen. Watch the video below to learn more about the new ODiN mouse and see it in action. “Does your arm or wrist feel tired or even hurt after holding the traditional mouse for a long time? Pain no more! The problem is solved with ODiN Aurora. As your wrist comfortably rests on the table or other surfaces, your shoulder and arm muscles can take a break, so you can focus on work, game, or both, or anything! ODiN Aurora presents you a whole new experience with computer and mouse. The world’s first laser projection mouse redefines your daily user habits for designing, gaming ,work, and everything. Intuitive and convenient, ODiN Aurora is your must-have gadget for computers and laptops. It’s all designed, for you. The ODiN projection mouse is currently over on the Kickstarter crowd funding website looking to raise $50,000 in pledges to make the jump from concept to production. So if you think ODiN is something your working desktop could benefit from, visit the Kickstarter website now to make a pledge and help ODiN become a reality with pledges starting from just $49.